We arrived here by a short flight with Alaska Airlines from Sitka; as you will see by this MAP that the actual airport is on an island and one has to (pay and) travel on a 3 minute ferry to cross to the main island. 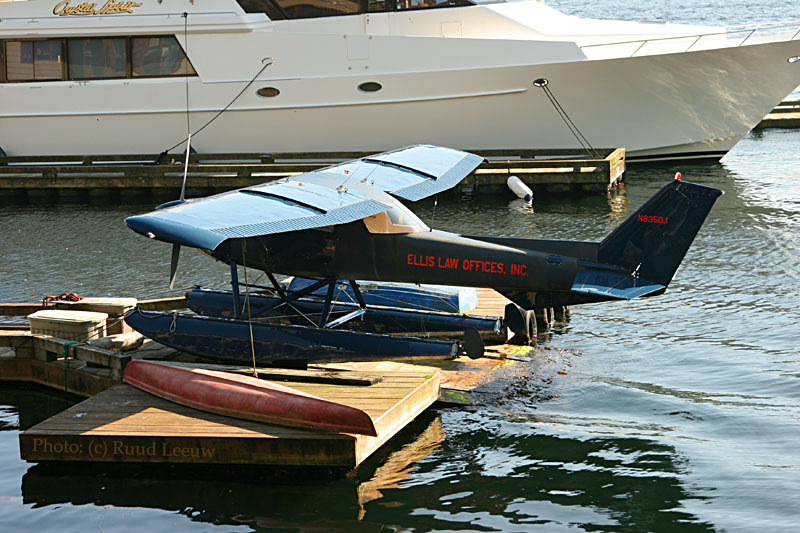 I did notice floatplanes land here at the airport (PAKT) sometimes too, but the actual floatplane action is on a long stretch of docks, at the seaplane base (5KE). 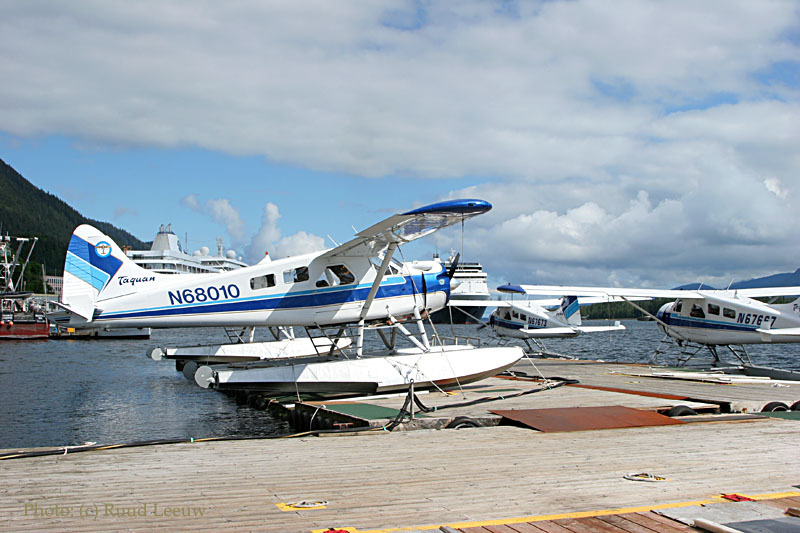 I started my photography along the Ketchikan waterfront at the Seaplane Base of Taquan Air Service; I asked for permission to do some photography and they did not mind at all. Plenty of action to enjoy here! 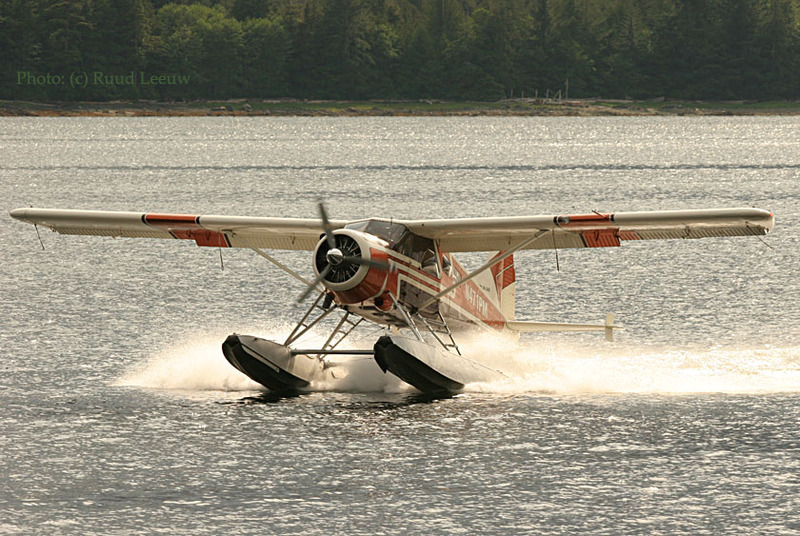 This is N37756, which is a DeHavilland DHC-2 Beaver with c/n 1456. Its history dates back to its delivery on 13Feb61 as G-203 for the Government of the Republic of Ghana; it also operated for the Ghana Air Force. 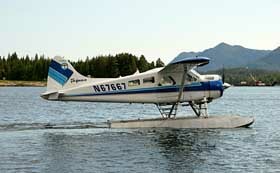 It was registered as N37756 on 19Jul00 to S & S Aircraft Leasing, Ketchikan,AK and is operated by Taquan Air Service. "Our business name is Venture Travel LLC dba Taquan Air. 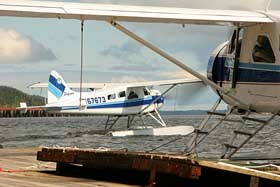 Taquan Air Service closed its doors in 1999 and Venture Travel LLC dba Taquan Air began a few months later in 2000. All aircraft are owned by this company and/or S&S Aircraft Leasing. 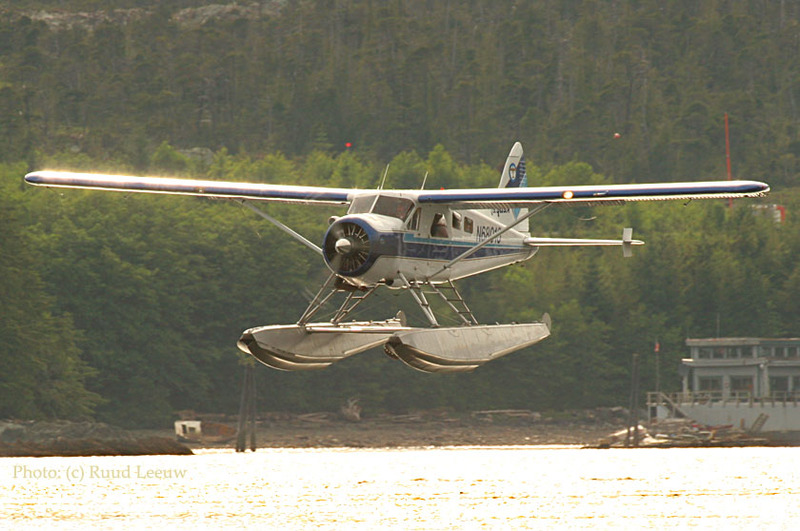 With cruise ships in town it is a constant coming and going here with floatplanes (a.k.a. 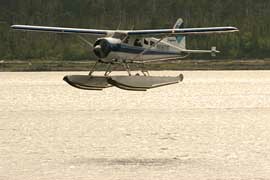 seaplanes). 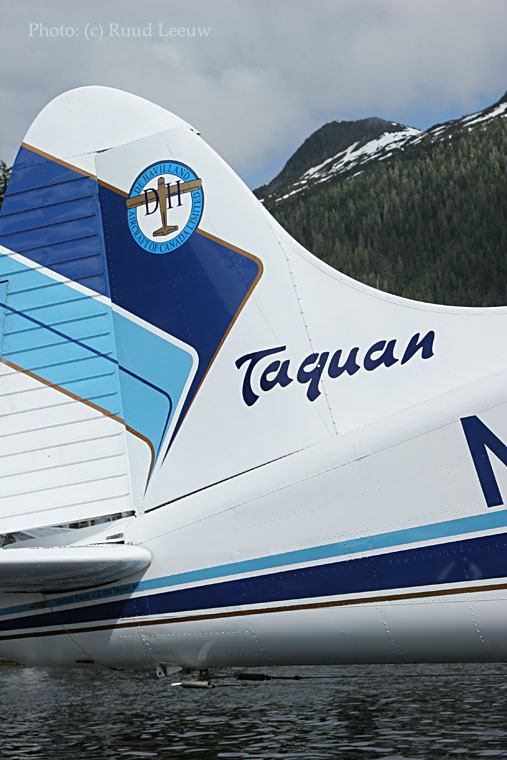 Taquan Air is one of the operators here who provide a local delicatesse: the Misty Fjords flightseeing; but they also do bear viewing trips, charters and scheduled services to Prince of Wales, Metlakatla, and Hyder. 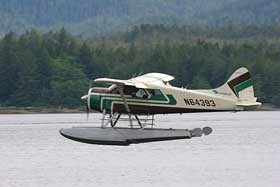 Flights over the lush wilderness of the Tongass National Forest is indeed a pleasure to enjoy. We see here DHC-2 N67673 (c/n 1284) depart for such a trip. C/n 1284 was delivered on 25Nov58 as 57-2586 to the USAF (type L-20 / U-6A-DH). Its military career ended upon its storage at Davis Monthan 28Mar72 to 06Feb76. It became N67673 for Hillcreast Aircraft of Lewiston,ID but I don't know when exactly. 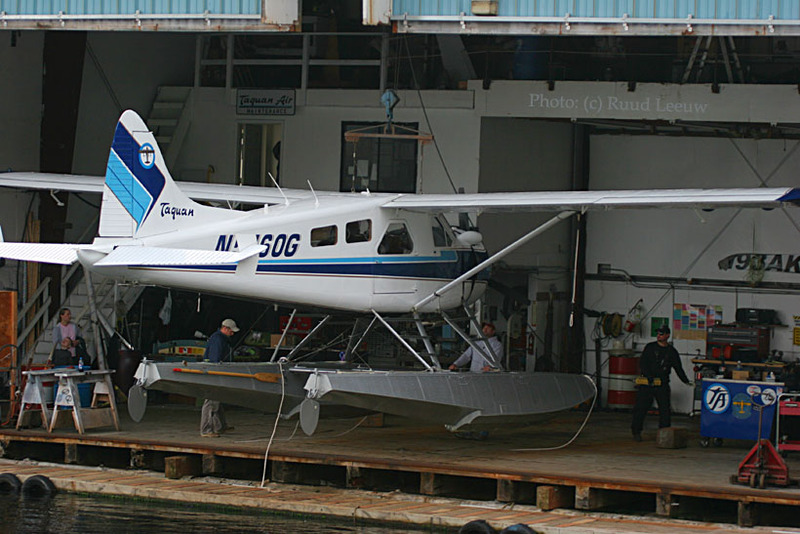 It has been registered to Taquan Air (Metlakatla,AK) / S & S Leasing Inc. of Ketchikan,AK since 19Jul00. When I walked up here first N68010 was firmly tied to the dock; it was Sunday June 18th and no ships in town. The next day (the weather a little less sunny but one has to count the days it doesn't rain here). 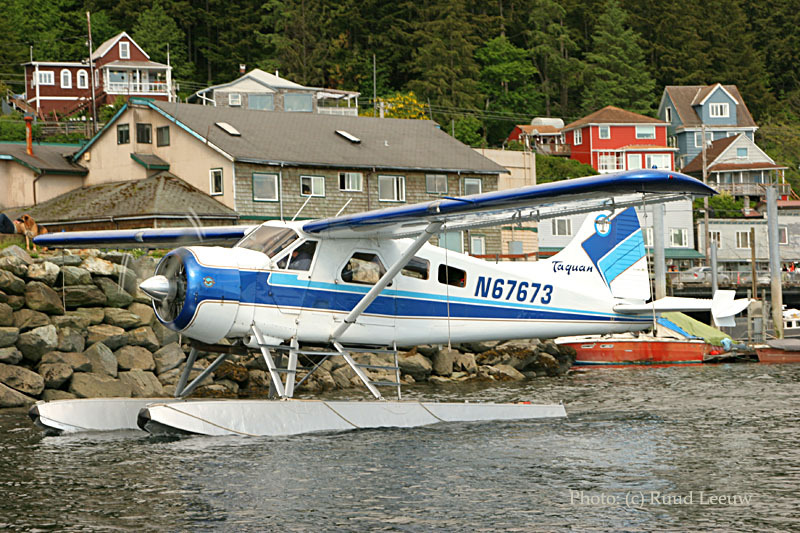 The next day (my only full day at Ketchikan) business was better and N68010 was back in action. C/n 1243 was delivered on 18Jul58 as 57-6150 to the US Army. It was stored at Davis Monthan from 18/02/72 to 19/02/76. Its civilian career started as N68010 for Flight Systems of Newport,CA and a newly issued Airworthiness Certificate dated 10Jun76. 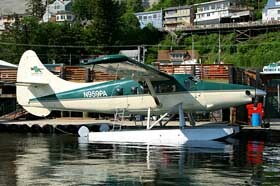 The next owner was Temsco Helicopters Inc / Temsco Alaska Airines Commuter of Ketchikan,AK but I have no date for this. Next was Taku Glacier Air Inc. (Juneau,AK; date?) 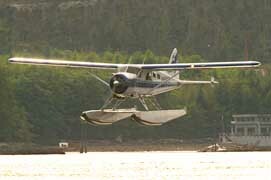 and Ketchikan Air Service Inc. (Ketchikan,AK), registered in June 1994. It was reported to have amassed a total of 7,243.00 flying hours in 1998. 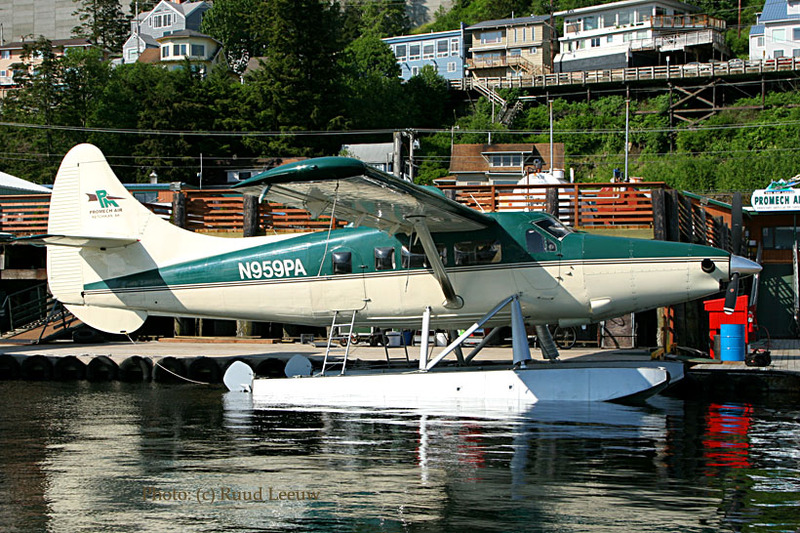 Its present owner S & S Leasing Inc. of Ketchikan,AK has it registered since 19Jul00. 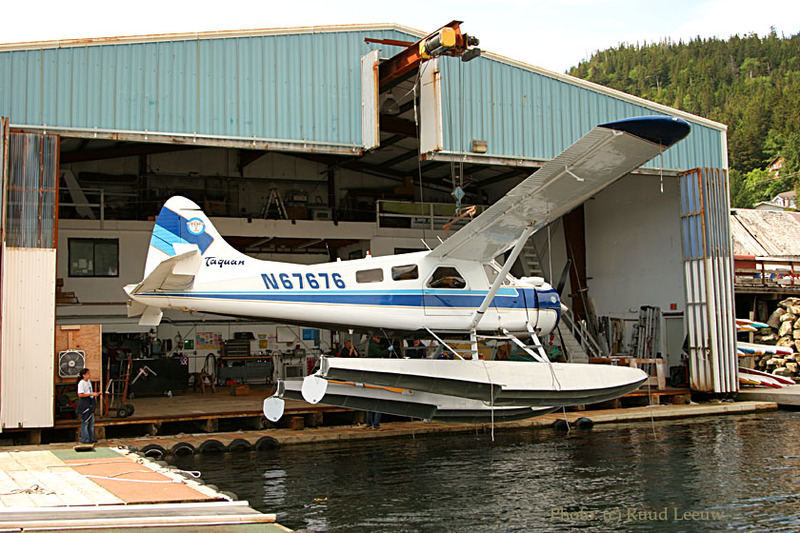 These floatplanes have a funny way of getting in the hangar! Both c/n 847 (fate unknown) and c/n 809 (no.2) have been issued tailnumber N67676. C/n 809 was delivered on 18May55 with serial 54-1676 to the US Army. Its first civilian identity was N9771Z for one Harold J. Hansen of Seattle,WA in Jul70. Later it became N64395 for Stikine Air Service Inc. of Wrangell,AK (no date). It was reported at Kenmore on 15Oct78. 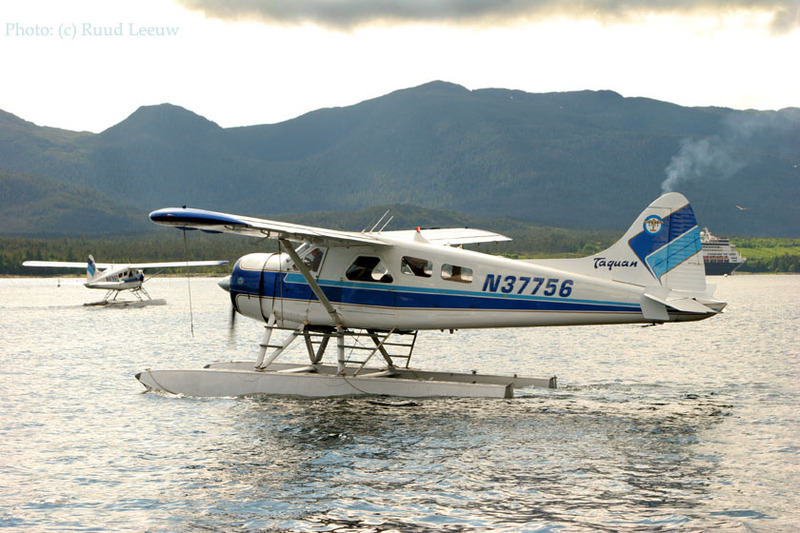 It was reregistered during Feb91 to Wings of Alaska / Alaska Juneau Aeronautics Inc. of Juneau,AK as N93AK. It was involved in an accident on 12Jul02, as can be read in the NTSB Accident Report no. ANC02LA076. But fortunately it was repaired and on 12May03 it was registered to Venture Travel LLC. (Ketchikan,AK) and as one can see is operating in Taquan colours (see also remark on top of page by Wendy Walden of Taquan Air). So how do they get on the dry..? This is quite spectacular, as we see it demonstrated by N67673: coming at moderate speed and going full bore on this ramp, which will tilt forward and gets secured by the ground staff. One of my better photos of this trip I think. 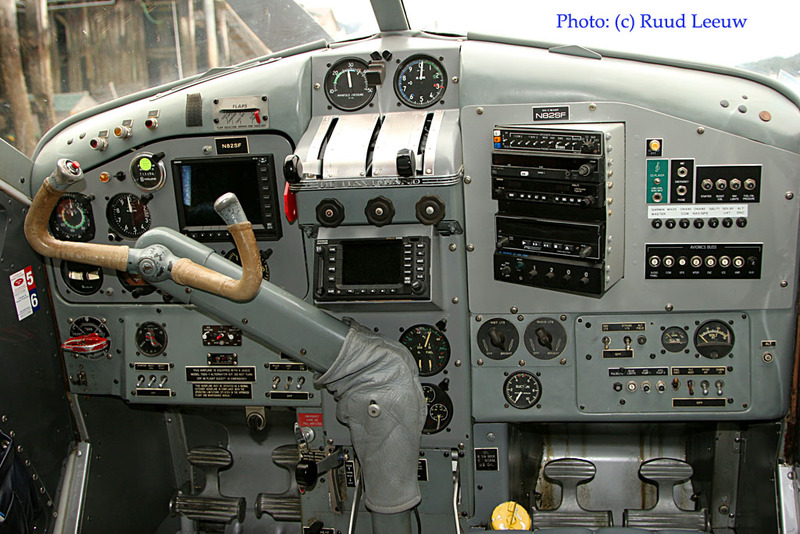 This DeHavilland Beaver has c/n 1284 and was delivered on 25Nov58 as 57-2586 to the USAF. It suffered a period of storage at Davis Monthan AFB from 28Mar72 to 06Feb76. its commercial career took of as N67673 for Hillcreast Aircraft,Lewiston,ID but I fear I have no date for this. 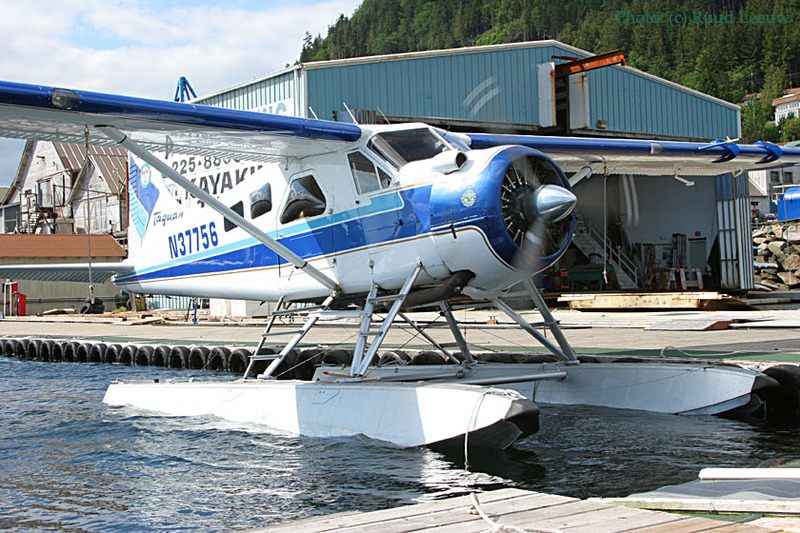 Taquan Air Service Inc. (Metlakatla, AK) / S & S Leasing Inc. (Ketchikan,AK) entered the scene with its registration on 19Jul00. This is c/n 1309 and railnumber N67667 has been issued for a 2nd time (the first time was on c/n 401, which is still about..). 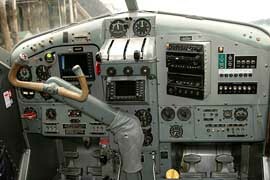 This Beaver was delivered 17Feb1959 with serial 58-1986 to the US ARMY. It was stored at Davis Monthan 13Apr72 to 06May75 and was registered N67044 for Civil Defense of Clearwater,FL but this was again cancelled 01jun79. Then it became C-GWPF for Winde Pacific Forest Products, BC and Wolverine Air leased it in 1981. 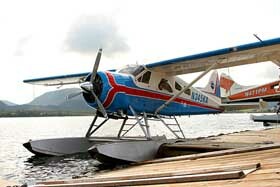 Harbour Air flew 'WPF in 1982 and it was noted with titles on 24Mar83 at Vancouver, BC. Registration was cancelled in Aug89. Airworthy on 15Aug89 it was at some point registered as N450DB to David P. Brown & Jacqueline L. Brown of Juneau,AK. It then saw use with Wings Air Group Inc., also of Juneau,AK. Tailnumber N67667 was assigned for Venture Travel LLC. 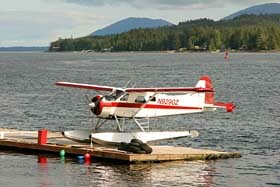 of Ketchikan,AK and the registry was revised for Taquan on 06Dec04. Taquan Air Service had closed it doors in 1999 and Venture Travel LLC dba Taquan Air began a few months later in 2000. 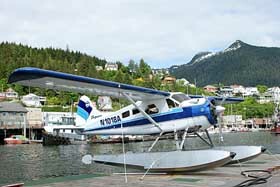 On 22Sep08 it was registered to Blue Aircraft LLC of Ketchikan,AK. Don't forget to notice the fantantastic scenery in the background! N1018A sits here securely moored. C/n 178 was delivered on 29May52, but I am not sure to whom as I have tailnumber N52409 for Air Carrier Service Corporation, but no date of this registration. It went to South America and became registered HP-375 for Turismo Aero S.A. (noted 1970 in register). It returned to these colder climates, as N1018A for Westflight of Ketchikan,AK (date?). It received a new Airworthiness Certificate (upon reintroduction to FAA Register?) on 16Jun83. 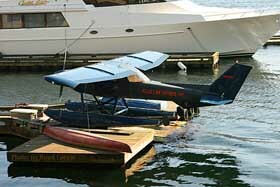 During Aug87 it was registered to Kenmore Air Harbor Inc. of Kenmore,WA. 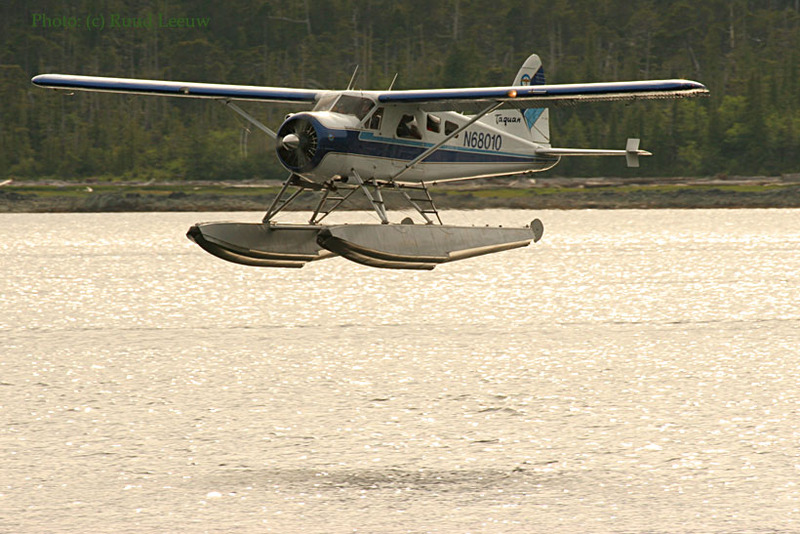 And Taquan Air Service Inc. (Metlakatla,AK) / S & S Aircraft Leasing Inc. (Ketchikan,AK) have ownership since 19Jul00. C/n 1456 was delivered on 13Feb61. As G-203 it served the Government of the Republic of Ghana / Ghana Air Force. 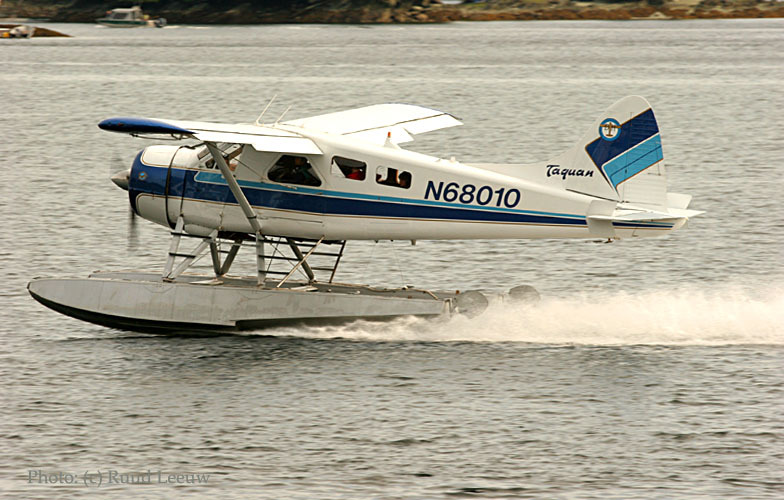 It moved to these parts and was registered as N37756 for S & S Aircraft Leasing / Taquan Air on 19Jul00. Taquan Air Service closed shop in 1999 and Venture Travel LLC dba Taquan Air got operations restarted in 2000. This c/n 236 coming towards the docks, with a nice coastal backdrop. It was delivered on 22Apr52 as 51-16483 to the USAF. As N5160G it was registered to the Civil Air Patrol Inc. in May71. At some point Oscar A.Fontaine of Westport,ME took ownership (but no details). DHC-2.com has it down as a Kenmore conversion, but I don't know what that entails exactly (civilian conversion?). Next we have Robert C. Warren (Sr.) of Portland,OR as an owner (no date). Scudero Inc. of Ketchikan,AK had it registered during Jan95. 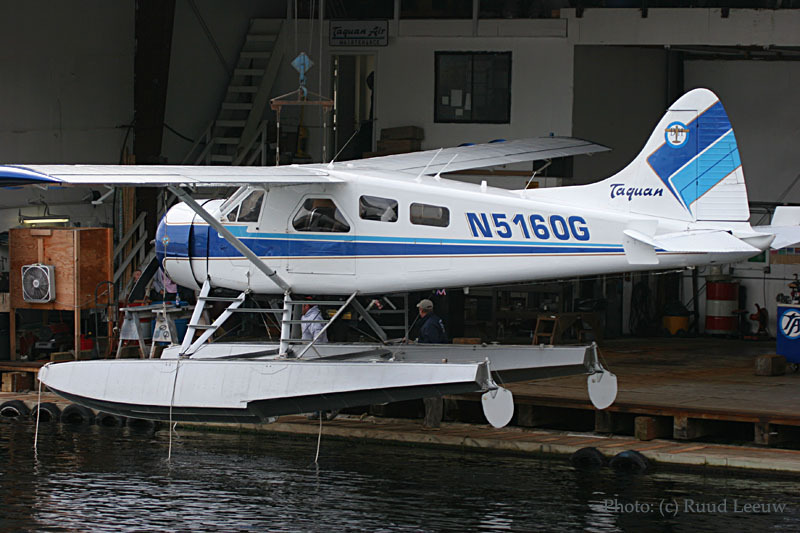 S & S Aircraft Leasing Inc. / Taquan Air was listed as owner/operator on 19Jul00. And we see N5160G being lifted into the hangar, which involves quite a bit of manhandling in the process. C/n 1306 was delivered on 05Feb59 as 58-1984 to the US Army. Davis Monthan AFB was its temporary home upon its storage from 30Jun72 to 06Feb76. N67678 was its earliest civilian identity, for Hillcrest Aircraft of Lewiston,ID, date unknown. 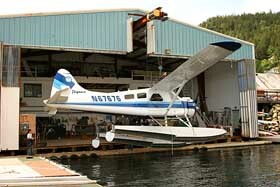 Kenmore Air Harbor Inc. of Kenmore,WA also took ownership, but again no date. N345KA became its tailnumber for Ketchum Air Service Inc. of Anchorage,AK On 09Oct97 it was registered to Ketchum Aircraft Leasing Inc. (again of Anchorage,AK). 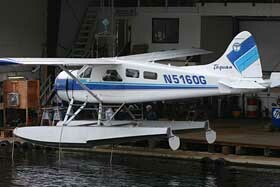 Present operator Sea Wind Aviation Inc. (Ketchikan,AK) had its ownership registered on 30Jun05. Fate struck a blow on 16Aug07, the anniversary of the De Havilland DHC-2 Beaver, as that day N345KA was involved in a deadly accident... Nine people were on board, 5 perished while the remaining 4 were injured. This brightly coloured Beaver has c/n 1041. 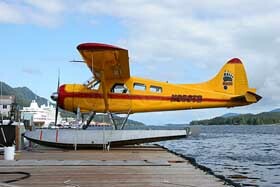 The tailnumber was revised to C-FJXP on 10Apr90 for Hauleminn Air Service Inc. (Air Hauleminn; I think you have to voice this to fully appreciate the name…) of Kipawa,ONT. Southern Interior Flight Centre of Kelowna,BC had its ownership registered on 05Jun91 and a new Airworthiness Certificate was issued on 18Aug91. 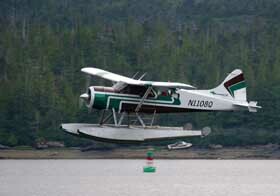 Tailnumber N930TG was registered for Ted Gerken of Illiamna,AK during Jul91. RDM Pilot/Guide Ltd. brought it to Ketchikan with its recent registration on 10Jan06. "Many pilots over the years have discussed what it would take to do some kind of group ownership. Here is a formula that we came up with that my not be the most accurate but works great for comparing aircraft to aircraft. Hourly fuel cost times 3 determines hourly operating cost. 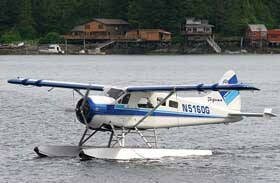 Example: DHC-2 Beaver - 25 gallons per hour times $4 per gallon times 3 equals $300 per hour. (25 x 4 = 100 x 3 = 300) Fuel price is the best way to keep the operating cost tied to the change in economy. The fuel usage is the quick and dirty way to judge the operating cost of the aircraft. The multiple of 3 brings the flight hours required into a practical number to work with. Now the second part to the formula: At least 150 hours per year if the plane is payed for. At least 300 hrs/yr if making payments towards a used aircraft and at least 500 hrs/yr towards a new aircraft. Whether or not you fly the plane the annual cost will be the minimum hours per year times the hourly rate minus the fuel cost. Example: 150 X $300 = $45,000/yr. If you fly the plane very little then subtract $15,000 of fuel. $30,000/yr should pay for insurance, hangar, Annual and reserves for engine, propeller and accessories overhaul. The number may seem high but, the less a plane is operated the more expenses you'll have per hour (many parts have calender life limits). Insurance is fixed and not required if you're the sole owner. The cost of hangar space is different everywhere for everyone but, if you had partners the hangar owner will want compensation. You may have a way to keep the maintenance cost lower, if so, lower you're minimum hours needed flown per year. Say you own a private airstrip, you're an IA mechanic and don't insure. Take your minimum hours to 50 hrs/yr. $10,000/yr for reserves and basic preventive maintenance is not out of line for a 450 horsepower 7 place $350,000 investment just kept airworthy. Back to the 150 hrs/yr base. Say there is 3 partners on this Beaver, shared responsibility is 50 hr/yr or 4.2hrs/month. When I take the plane flying I record the hours flown in the flight log and pay $300 per hour. Of course if I don't fly this month at all I just write a check for (4.2 x $300 - 25 x $4) $840. After a couple years go by we find that we're over paying at 150 hrs/yr so we readjust to 125hrs/yr or give back money at the end of the year. Another option is to put the excess amount into CD's and Bonds and use it for self insurance. Once the plane begins to bring in too much money it's time to buy a second anyway and the self insurance fund can be used towards both aircraft." 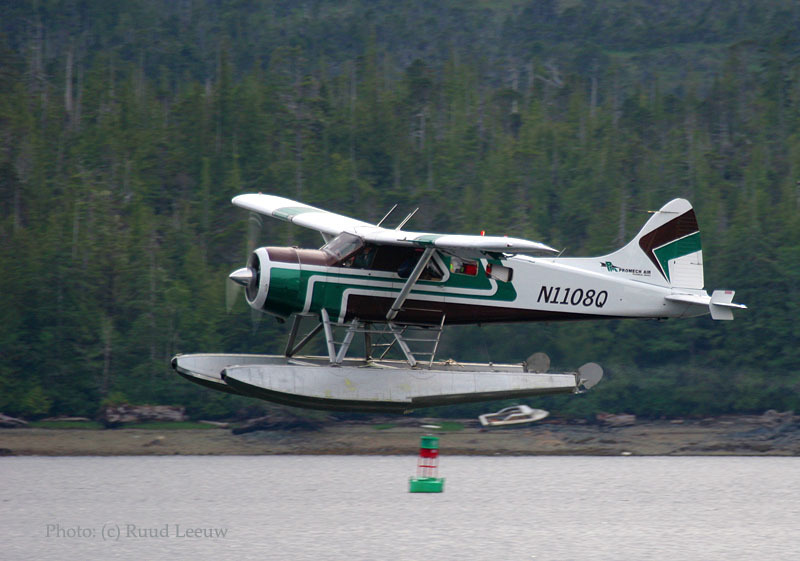 DHC-2 N9290Z with the beautiful Tongass Narrows as a backdrop. 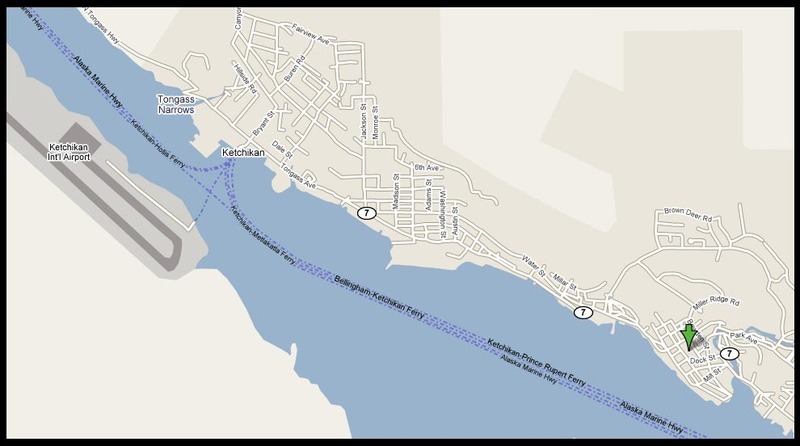 Tongass Narrows is Ketchikan’s "main street"; this channel is used by cruise ships, commercial tugs, fishing boats, and of course floatplanes…. Some history on c/n 1387: built in 1959, it was delivered as 58-2055 to the US Army. It joined other Beavers in the storage yard at Davis Monthan AFB from 07Feb72 to an unspecified date. It was registered as N9290Z for Harold J.Hansen of Seattle,WA (date?). 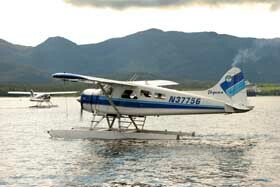 For a period it was leased to Island Air Service and it went to Kodiak Western circa 1977. 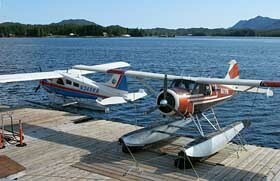 Robert G. Stanford / Redemption Inc. (Island Air Service Inc., Kodiak,AK) became an owner (date?) 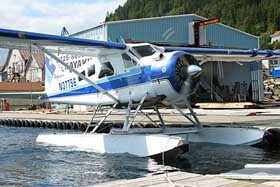 and Taquan Air Services Inc. of Ketchikan,AK bought it in 1998. 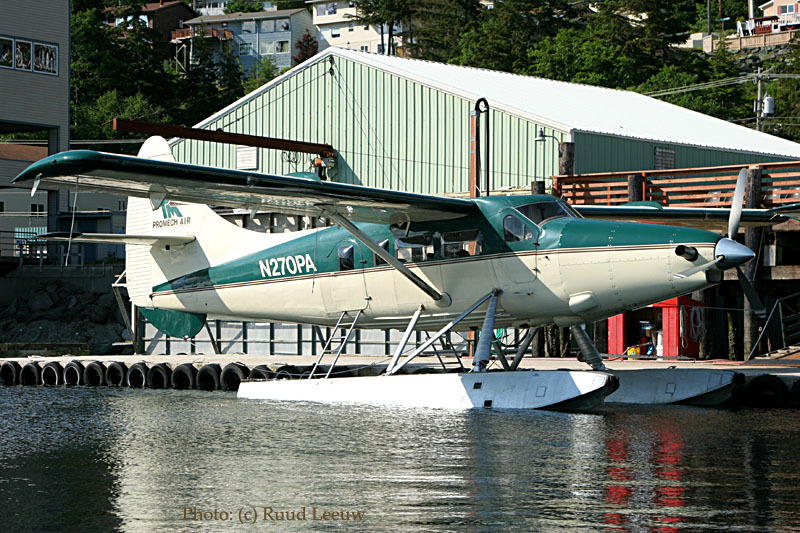 FAA’s database (in Nov.2006) lists its present owner as Radial Power Enterprises LLC of Ketchikan,AK since 11May05. 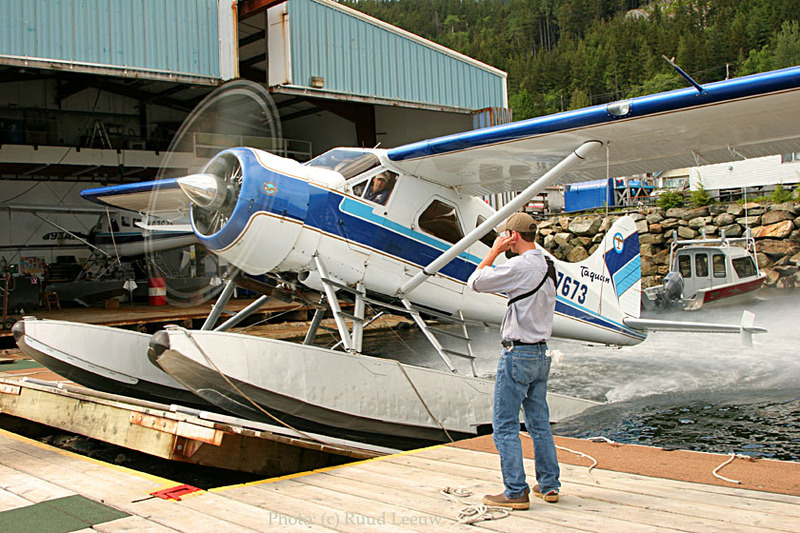 Fatal news on 23JUL2010: "Pacific Airways DHC-2 Beaver crashed on the former Ketchikan Pulp Company landfill site early Friday morning, killing the only occupant, pilot Josh Murdock." C/n 1366 Is presently registered as N471PM and enjoys some peace and quiet here. This L-20 (U-6) Beaver was delivered on 08Jul59 as 58-2034 to the US Army. It was reported at Prestwick,UK on 26May62. At some point it was registered as N55235 but no details have surfaced. 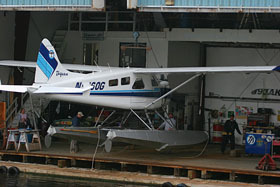 Its next identity was N471PM for Pro Mech Air here at Ketchikan,AK. 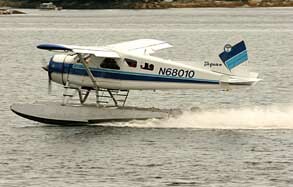 Thomas I. Carlin of Carlin Air (again, here at Ketchikan) had it registered during Feb92. It is presently registered to Jeffrey J.Carlin (family? ), since 10Apr00. Another fine looking specimen… And this one may even be for sale ?! N96DG has c/n 702 and its career started on 28Sep54 with it sdelivery as 53-7894 to the US Army; it was stored in Arizona’s desert, at Davis Monthan AFB, from 09Nov75 to 28Feb77. First it went to Corps d'Aviation d'Haiti / Haitian Air Corps. Its career took another turn when it was registered as N99132 for Summit Aviation of Middletown,DE but I have no date for this event. In Feb77 it was registered to W. R. Perry / Etal and as C-FBDR it was registered on 29Feb88. Whis was cancelled in Aug90. As N96DG it was noted at Kenmore,WA. on 06Aug90. On 08Aug90 it was registered to Aircraft Marketing & Leasing of Fairbanks,AK but FAA’s database has a remark "undeliverable triennial" so this company probably does not exist anymore; so who owns N96DG now, the titles suggest active operations by Southeast Aviation..? Martin Prince Jr saw it in Bethel,AK in Aug07, replacing the unfortunate DHC-2 N734Q. 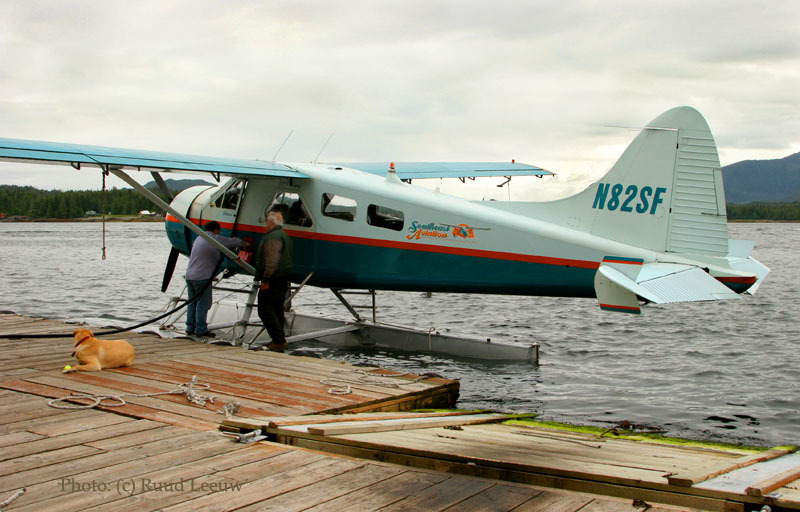 Since the salmon had not started their run when we intended to do a bear viewing trip from Homer, I had hoped to do a trip from Ketchikan. So I was easily convinced to accept a deal from Southeast Aviation, even though I had heard the salmon run still hadn’t started here either. 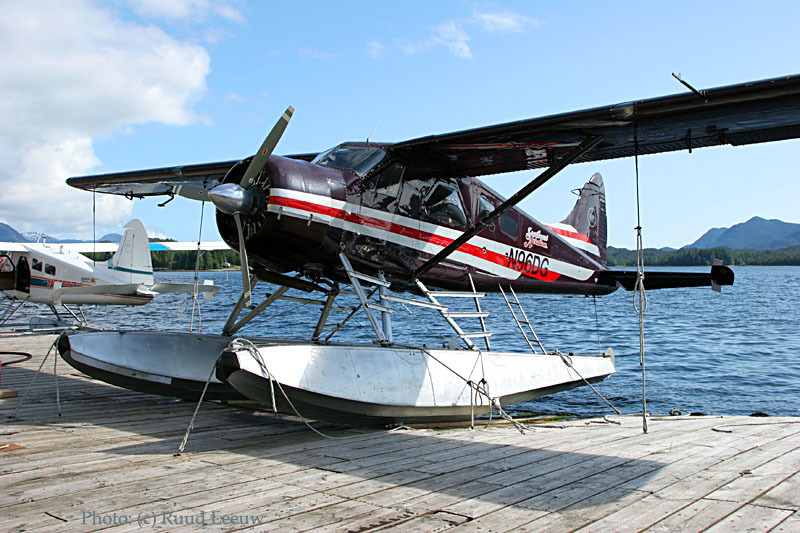 We had a nice flightseeing trip which included a landing on a remote lake, but no bears of course. It was delivered on 05Sep52 with serial 51-16821 to the US Army. Its military career ended with storage at Davis Monthan AFB from 07Mar72 to 09Feb76. Tailnumber N9279Z was assigned for Cal Vada Aircraft Inc. of Homewood,CA. No date. An Airworthiness Certificate was issued on 08Apr76. Michael A. Brown, Kings Beach,CA appeared on the list of owners or maybe leased it as it went back to Cal Vada Aircraft Inc. Registration was revised on 20Feb02 for Snow Mountain Enterprises LLC., Ketchikan,AK. 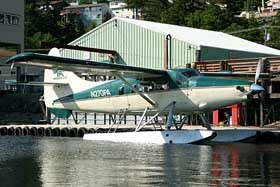 On 04Jun04 it went to Southeast Aviation here at Ketchikan,AK. It was delivered on 13Jul55 as 54-1697 to the US Army. Maybe it was stored as well, I don't know. I do know a new Airworthiness Certificate was issued on 18Jan79. 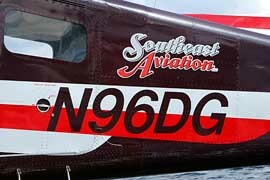 Maybe this coincided with the purchase by Rodney F.McLean of Kalispell,MT who had tailnumber N44CD assigned to it. Rodney F. McLean also had something to do with Airlease Inc. of Renton,WA. Tailnumber N82SF was reserved 01May93 but at that time it was still owned by Airlease Inc. In Oct93 it was registered to Sound Flight Inc. of Renton,WA. 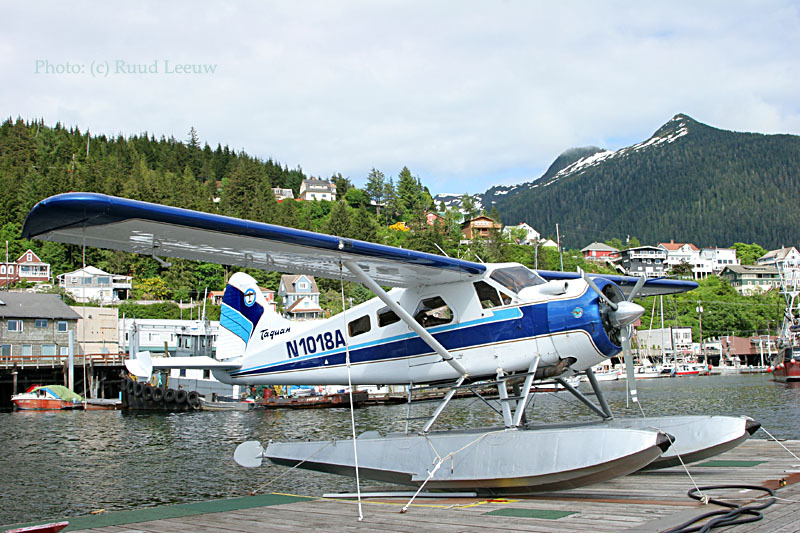 from there it went to Snow Mountain Enterprises LLC., Ketchikan, AK (registered on 05Jul01), which seems to operate as Southeast Aviation, here at Ketchikan,AK (because when I checked in Nov06 the FAA database still had it as Snow Mountain Enterprises). 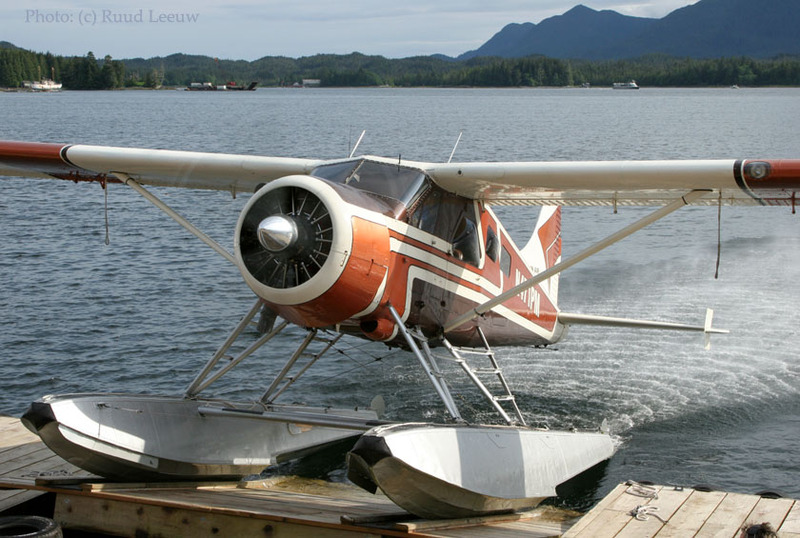 Maybe not as classic as the DeHavilland Beavers on this page but a remarkable floatplane nonetheless: N8350J Cessna 152G (serial no. 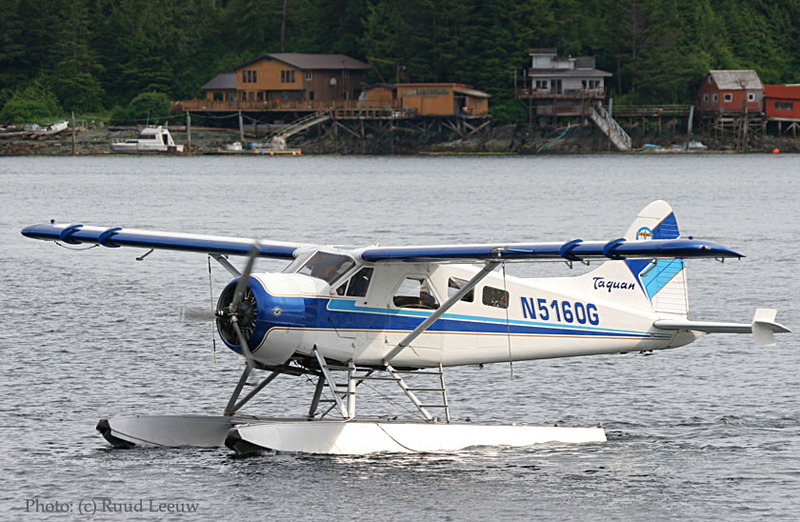 15066250), registered to Ellis Law Offices of Ketchikan,AK (since 03Jan89; manufactured in 1967). At Promech they frowned upon my presence on the dock, but maybe that was because at first I had seen no one around to ask permission to 'trespass' here. We see DHC-2 N64397 being prepared for it spassengers and a speedy departure. this is c/n 760 and it was delivered on 31Jan55 as 53-7943 to the US Army. 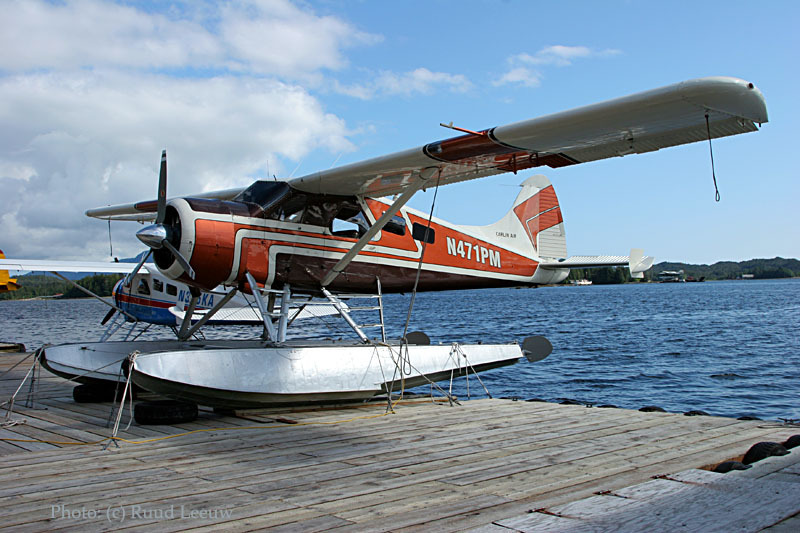 It was registered as N64397 to that familiar name in "world-of-Beavers": Kenmore Air Harbor Inc. of Kenmore,WA (but no date of this). During June 1992 it was registered to its present owner and operator: Promech Inc.of Ketchikan,AK. It did get registered to Vincent D.Ditmore (Ketchikan,AK) during Sep93 but this may have fallen thru or was reversed as since 07Oct05 it has been registered again to PM Air LLC. 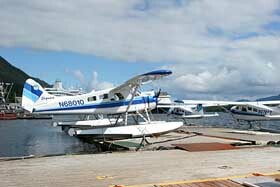 Promech also operated these impressive Turbine Otters; one is N270PA, a DHC-3 with c/n 270. 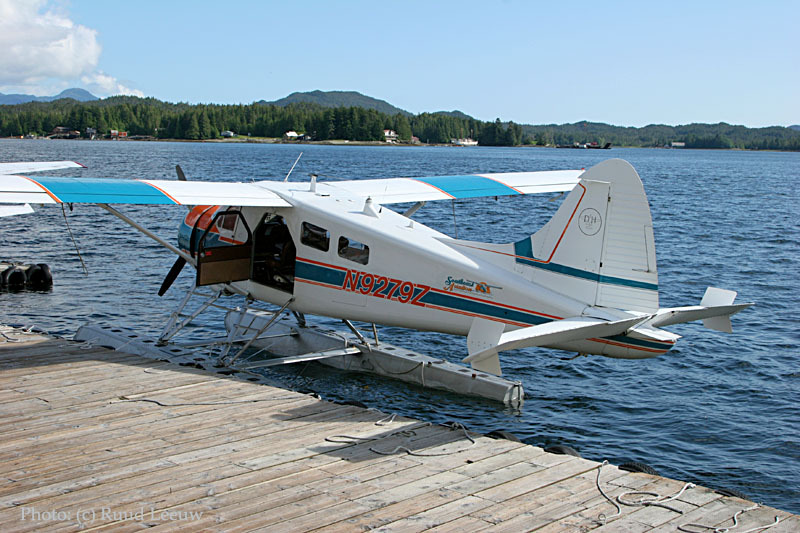 It has been registered to Pantechnicon Aviation Ltd, of Minden,NV since 14Jan97. It was built in 1958.
http://vimeo.com/79908357 About 27mins of bush flying from these docks. 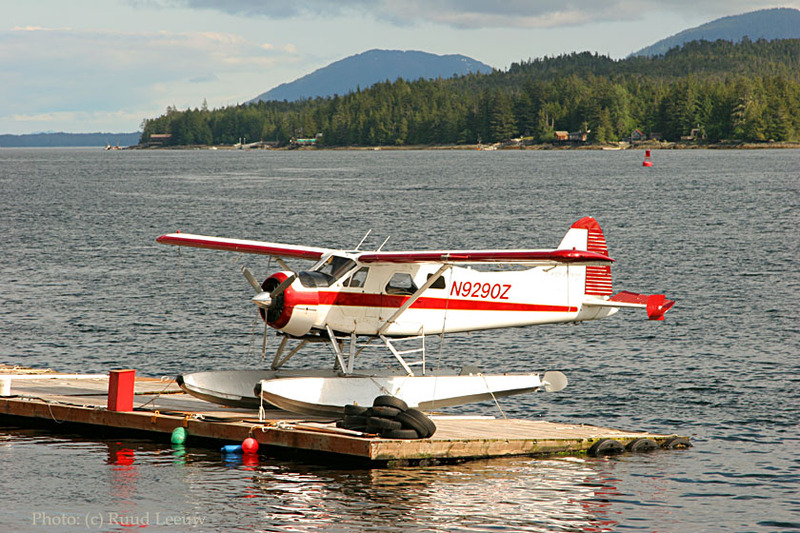 Update nov.2014: Promech Air (Z3, Ketchikan Int'l) ceased offering scheduled services with effect from October 1 ch-aviation has learned. 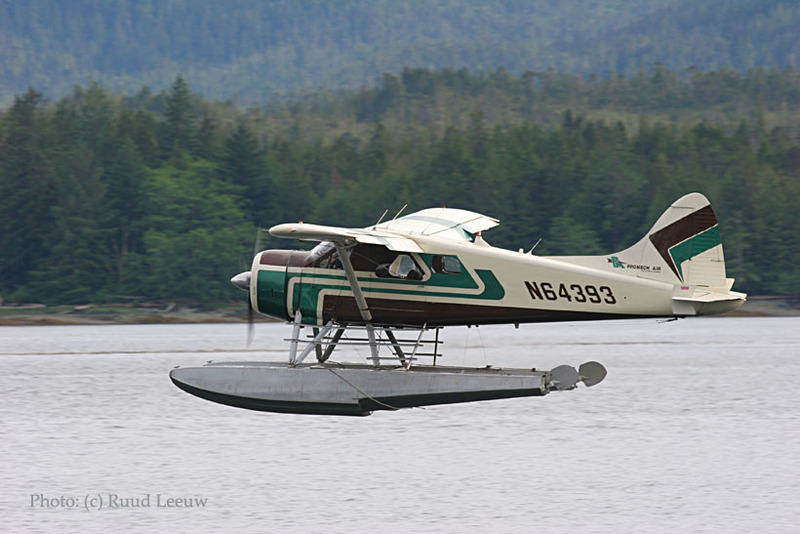 Airline sources state that the carrier may revisit the decision again in May 2015 but for the meantime, has chosen to focus on sightseeing flights to Misty Fjords National Monument and Neets Bay Salmon Hatchery as well as air taxi and charter operations. 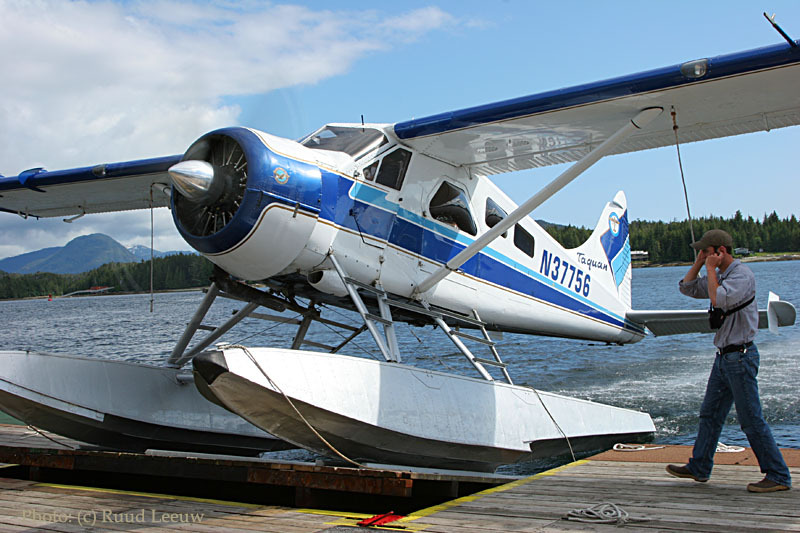 The south-east Alaskan carrier's fleet includes four DHC-2 Beavers and five DHC-3s and Promech had offered scheduled services between Ketchikan Int'l, Craig, Klawock, Hollis, Metlakatla, Thorne Bay, and Waterfall. N959PA is another modified DHC-3; it has c/n 159 and is with Pantechnicon Aviation Ltd since 25Nov97. It was built in 1956. I had Otis Redding on my mind: Sitting on the Dock of the Bay I felt very relaxed aiming my camera on all the seaplane action going on around me! This stylish departure is done by c/n 416 N1108Q. It was delivered on 11Dec52 as 51-16851 to the US Army. As N1108Q it was registered to Kenmore Air Harbor Inc. around 1985. Next was Temsco Helicopters Inc. of Ketchikan,AK (no date). 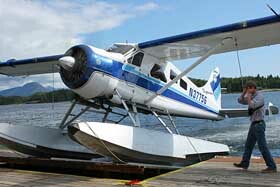 During August 1993 Michael B. Salazar of Ketchikan purchased it. Six years later, on 16Apr99 it was put on the market for $315,000.00 by Booker Aircraft Sales of Kelowna,BC. Several years later we see it being registered to Kevin M. Hack of Ketchikan; 02Mar00. Since 07Oct05 N1108Q has been with Promech (PM Holding LLC). This is c/n 845, which was delivered on 06Dec55 as 54-1701 to the US Army. 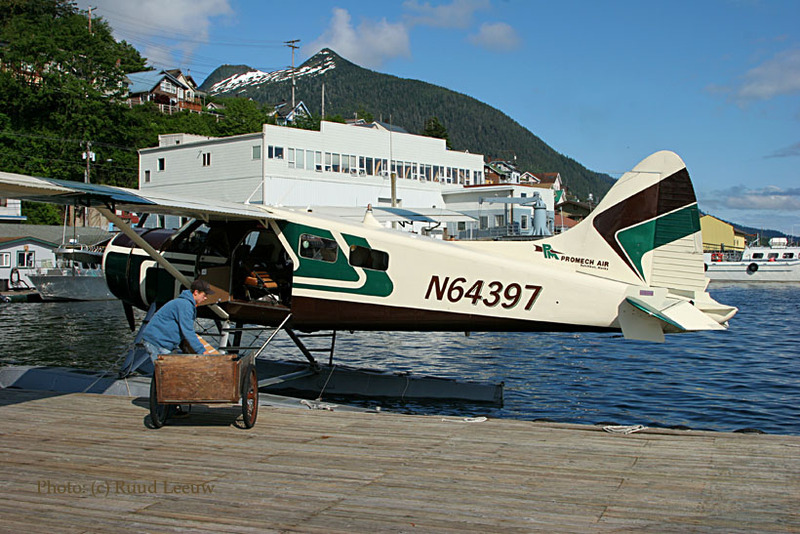 Civvie street began as N64393 for Temsco Helicopters Inc. of Ketchikan,AK with an Airworthiness Certificate issued on 19Dec79. Flair Air has been named as an owner or operator but I have no details. Next we see South East Alaska (Ketchikan, 1981) and Steven K. Schrum (Ketchikan, Feb94). It stayed in Ketchikan but transferred to Mink Bay Partners in May95. Next we see Kevin & William Hack operating it in ProMech colours. Finally we see it registered to PM Holding LLC. of Ketchikan,AK on 07Oct05. This is N68010 which we already discussed. 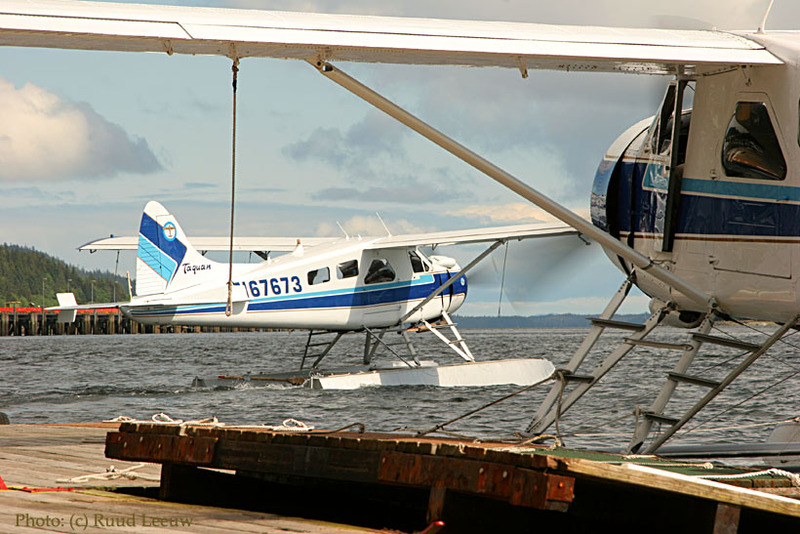 It seems fitting to end this page with a DeHavilland Beaver (N471PM) docking, done for the day ..